Editor’s note: This article is a collaboration between Arizona Center for Investigative Reporting and KJZZ. It is eligible for republication by partner news organizations only with express permission. This year, Maricopa County voters approved every bond and override proposed by the county’s school districts. As a result, hundreds of millions of dollars in property taxes will be used to pay for various projects, from new buildings or buses, in the case of the bonds, to increased teacher salaries and textbooks, in the case of overrides. Putting the funding on the ballot lets communities decide whether to exceed the state’s funding. When the new funds go toward large capital projects, districts have to decide who will do the work of designing, then building – or refurbishing – school facilities. State procurement laws dictate how school districts choose the companies that will do that work, and are designed to ensure government contracts are awarded based on an honest evaluation of the applicants, not cronyism. But a closer inspection of which companies end up securing the contracts reveals a small group of builders dominate the K-12 design and construction sector, and get the bulk of their work in Arizona from school districts. The same companies that end up with an oversized portion of K-12 work also largely finance the campaigns aimed at persuading the public to approve the proposals – often donating identical amounts to the same committees on the same dates. In contrast, Arizona’s public universities, community colleges and municipalities see significantly greater diversity among vendors for similar design and construction projects. Unlike candidate campaigns, where corporations cannot make direct contributions and individuals can only contribute up to certain limits – an attempt to prevent undue influence over elected officials – campaigns for bonds and overrides can accept contributions in any amount and from corporations. The financial support vendors provide the campaigns goes beyond what’s publicly disclosed in campaign finance reports. A “dark money” group named Arizona Coalition for Education Excellence was established specifically to hide additional financial support from schools’ vendors. The same companies’ executives also often sit on the boards of school district foundations, and the companies routinely sponsor the foundations and their activities. Some architects and contractors said they’ve been told by district employees the procurement process has been co-opted, and that the appearance of competition is a facade. Officials from the state’s School Facilities Board, which administers a comparatively small fund that pays for targeted school facilities, said they’ve heard rumors the district procurement process had become “an old boys club.” New laws requiring additional oversight for procurement practices may be necessary, SFB officials said, and the agency has already considered sponsoring legislation to that effect. AZCIR and KJZZ interviewed dozens of sources and scrutinized hundreds of campaign finance reports, business filings, non-profit disclosures and public procurement records to bring these relationships into focus. Together, the pieces reveal a symbiotic network that connects the financial interests of vendors with the needs of schools. Sources representing the builders who benefit from the system all said their motivation is to help children succeed, and school officials said the state’s procurement guidelines keep the process fair. But critics said the realities of Arizona’s education funding needs, coupled with rules allowing unlimited corporate financing of ballot measures and loose oversight of procurement, leads to too-cozy relationships between builders and the school districts they seek contracts from. They questioned whether competition is diminished given these conditions, and whether the large-dollar school projects benefit a small group of builders more than Arizona’s students or taxpayers. One district’s recent struggles related to a construction project highlight similar issues. In the Scottsdale Unified School District, the rollout of plans for a $229 million overhaul to its schools has led to the district hiring outside attorneys to look into whether procurement practices were properly followed, and the Arizona Attorney General’s office opened an investigation into the possibility of both civil and criminal violations there. In May, four school districts and several education advocacy groups called a press conference at Landmark Elementary school in Glendale to announce they were suing the state. Their problem? State funding for capital needs. Tim Hogan, the attorney representing them, argued the state isn’t living up to its obligations, which is leading too many districts to rely on local tax initiatives just to make repairs. Hogan won a similar lawsuit in 1994, and the Arizona Supreme Court ruled that funding capital improvements through local taxpayers is unconstitutional because it creates a system of rich and poor districts. The state responded to that lawsuit, in part, by creating an agency called the Arizona School Facilities Board (SFB) to ensure funding would be available to any school district. “We’ve built more than 300 schools since our inception in 1999,” Kerry Campbell, the agency’s deputy director of operations, said. The SFB is charged with giving money to schools for things like building needs and even books, she explained. Over the past 15 years, state lawmakers have reduced SFB’s funding from $930 million in 2003 to around $300 million in the most recent state budget. At the same time, schools have increasingly turned to bonds and overrides to cover basic needs, like replacing an aging school bus fleet. Across the state, the passage rate for school bond and override initiatives has been on the rise. This year, Maricopa County voters approved every bond and override proposed by the county’s school districts. 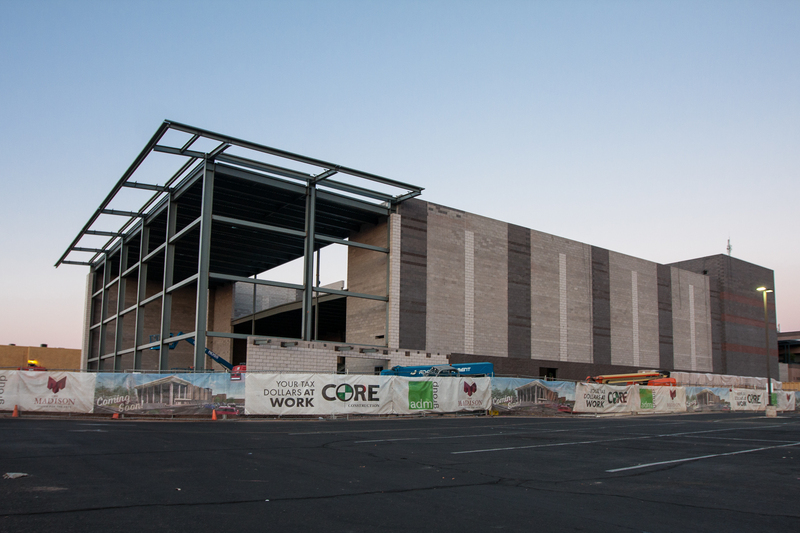 “K-12 is, by far, the most active entities that have bonds,” said Rebekah Morris, a construction engineer and owner of the Arizona Builders Exchange (AZBEX). AZBEX collects and compiles public procurement data for the group’s trade publication, which is sold to design and construction firms. “A city might have a bond every 10 years or so,” she said. But schools regularly go to voters to approve budget overrides about once every five years. For example, vocational district West MEC has passed two bonds in the last five years, and Tempe Elementary School District voters have passed a bond and a capital override in the last five years totaling about $200 million. Morris said the K-12 sector is different when it comes to procurement. In addition to the frequency that districts go to voters for funding, the projects are concentrated among a limited number of companies. “There’s a very few number of people actually getting work in this space,” she said. According to procurement records compiled by AZBEX, between 2013 and 2016, a group of three architects (ADM Group, DLR Group and Orcutt Winslow Architecture), three construction firms (CORE Construction, Chasse Building Team and McCarthy Building Companies) and three subcontractors (Wholesale Floors, Progressive Roofing and Pueblo Mechanical & Controls) ended up winning contracts for more than half of all K-12 projects that were awarded through the public procurement process. During that same period, Arizona State University contracted with repeat vendors only about 20 percent of the time. All three state universities, the state’s largest community college districts and several cities all show less concentration of projects going to repeat vendors. AZBEX tracks contracts that use public procurement practices, which accounts for roughly half of all government contracts. Officials at the SFB have a bird’s-eye view of this process because they review all public K-12 capital improvement projects to ensure they meet minimum state quality standards. Campbell, the SFB deputy director of operations, said there’s no simple explanation for the concentration of projects going to particular vendors. Four years of campaign finance records from K-12 bond and override elections in Maricopa County show significant contributions from the same companies who bid on – and in many cases win – contracts for the jobs the funding pays for. From 2013 to 2016, bond and override committees in Maricopa County received at least half of their funding from construction and design firms. For some districts, the financial support from potential vendors makes up nearly all of the campaign funding. In 2013 the committee supporting a $15 million bond election for Saddle Mountain Unified School District near Tonopah got more than 99 percent – all but $35 – of its funding from potential vendors. In 2014, the same committee, then supporting a $900,000 override election, collected at about 96 percent from potential vendors. Littleton Elementary School District proposed a $14 million bond in 2014, and a $4 million override in 2015. Yes For Littleton Kids, the committee running the campaigns, was supported entirely by construction and design firms for both campaigns. In 2015 Pendergast Elementary School District proposed a $7 million override, and in 2016 proposed a $60 million bond. The committee supporting the campaigns, Yes For Pendergast, was funded solely by architecture companies and contractors. Kimberly Moran, the treasurer for Continue the Quality, which campaigns for Avondale, Litchfield, and Agua Fria School Districts, said it’s clear why construction and design firms bankroll campaigns. “It’s no secret that it’s the folks that are going to actually be making money… that contribute to the campaign,” she said. Of the $122,000 her committee raised for elections in 2014, 2015 and 2016, $92,000 came from potential vendors. More than half of that came from three architects and three construction firms. “A $10,000 contribution to a PAC isn’t going to win you a bid”, Moran said, but financially supporting a bond effort “would be definitely a way to start relationships in the district” for companies hoping to land business with the school districts. Mitzi Epstein, a Democratic state legislator who represents Ahwatukee and who co-founded Yes Public Ed, a committee that ran campaigns for the Kyrene Elementary School District’s ballot initiatives, said the situation is less than ideal. “In order to build a school, we have to reach out to the vendors who might be building the school to pass the bonds, to pay those same vendors or different vendors,” she said. Epstein, who also used to serve on the Kyrene governing board, said she can see how people can infer that there is a quid pro quo for companies that give large sums to the campaigns, but stressed that the procurement process, which, in most cases, involves a committee review and a ratings based selection process, would prevent that. Representatives from the architecture firms, contractors and subcontractors that do much of the work in the K-12 sector say their motives are simple: to support public education because state isn’t providing adequate funding, because it’s the right thing to do. “It’s important to me to help kids,” Barry Chasse, the owner of the Chasse Building Team, said. “That’s what we believe is right is supporting our public school system,” said Natalie Orne, a business development director with CORE Construction. Many of the companies interviewed said K-12 school work accounts for significant portions – for some, around half – of their overall work. For some districts, the support goes beyond campaign financing. Several leaders and employees of these potential vendors are also active participants on district foundations, separate nonprofit organizations that raise money for a particular school district. Orne, for example, is the president of the Queen Creek Schools Education Foundation, as well as a member of the Pendergast Education Foundation and the Peoria Education Foundation. Vispi Karanjia, a managing partner with architecture firm Orcutt Winslow, is the Queen Creek Schools Education Foundation vice president and the Pendergast Education Foundation secretary and treasurer. Some of the support for bond and override campaigns coming from potential vendors has not been publicly disclosed, until now. In 2012 and 2013, a group named Arizona Coalition for Education Excellence raised about $449,000 and donated it to a variety of bond and override committees. Because it’s a 501(c)(4) nonprofit, the group isn’t required to disclose the source of their funds. That fact often earns 501(c)(4)s that spend money in elections the moniker “dark money” groups. “The sole purpose was to raise money for the bond and override committees,”she said. Elliott said the vendors also regularly directed funds to specific districts’ committees, and the reason they used a group that doesn’t publicly disclose the source of its money was to hide apparent conflicts. “If a vendor gave money to a particular district’s action committee, then the bond and override passed, and a contract was awarded to that vendor… it just doesn’t look good,” Elliott said. Dean Howard, who worked in public procurement for Goodyear and Phoenix and now works for a large electrical engineering firm, said he and others familiar with K-12 procurement are well aware of the pattern of school districts awarding more repeat business contracts than other public entities in the state. His company wouldn’t even attempt to secure school projects, he said. Laura Felten, the assistant superintendent for business operations at the Paradise Valley School district, said the pattern has nothing to do with favorites. “If you’re in a tenuous situation where you have a live campus going on and a very active community, you’re going to be using the people you’ve had success with in the past,” she said. Michelle Gayles, the chief strategy officer at the Phoenix Union High School district, said she believes the procurement rules prevent any undue influence from vendors. SFB’s Campbell said she’s observed that some school districts pick the same vendors over and over again. Campbell said her agency has considered supporting legislation that would add new oversight to the schools’ procurement process following bond and override elections. Right now schools must follow state procurement laws, but there is no central oversight for the process. Chuck Essigs, the lobbyist for the Arizona Association of School Business Officials, said he thinks the procurement practices in place now are sufficient and that he wouldn’t support adding new regulation for the process.